This is the fourth (and last) of the four innovative tools we’ve been looking at in the Better Twitter Analytics series, seeking a new way of looking at data to help you shape and improve your nonprofit’s social media strategy. Whether your nonprofit organization is new to Twitter and you haven’t yet chosen a Twitter analytics tool — or you’re simply looking for fresh insights — Klout is an excellent (free) service that's well worth a try. Not only does it give you a host of useful metrics that are hard to find elsewhere in one tidy package, it actively helps you understand what the numbers mean and what you can do with them. Summary shows you the four-quandrant Neighborhood Comparison Graph, described as “a way to visualize relative influence and audience size across similar users… based on factors such as how often they tweet, who they follow and who follows them and how their audience interacts with the messages they create.” (You can read more about the graph and what it means at http://klout.com/graph/.) At the bottom of the page are pictures of Twitter users you “probably” influence and are influenced by, as best Klout can calculate. Content doesn’t appear to be updated as often as it might be for optimum accuracy, but you should find it interesting to take a look at, to see what topics are associated with your organization’s Twitter account. Click on a couple of the most relevant topic links to see which other Klout users are talking about the same things, and you may find some new folks to connect with. Influence Tracker is less useful, I think. It seems to show the same faces every time and I suspect it needs a bit more work — my own Klout account shows I’m “losing influence” with a few people I haven’t been in Twitter-touch with for more than a year! There’s a virtual buffet of measurements to choose from on the Stats page of your Klout user profile, and most of the numbers here are actually useful to nonprofits trying to figure out how to make the most of their time on Twitter. Amplification Ability — This is the likelihood that your message will generate retweets or spark a conversation. The ability to create content that compels others to respond, or increase the velocity of content so that it spreads into networks beyond your own is a key component of influence. Are you broadcasting or participating in conversation? Factors measured: Unique Retweeters, Unique Messages Retweeted, Follower Retweet %, Unique @ Senders, Follower Mention %, Inbound Messages Per Outbound Message, Update Count. In fact, Klout goes beyond the usual aggregates for ranking “influence,” which can be hard to interpret for most of us, and thoughtfully supplies a lot of much more specific measurements. These are divided up into four categories: Reach, Demand, Engagement, and Velocity; you can just click the name of any variable on your stats page for an explanation of what it is all about. The percent of your network that has @ messaged you in the last 30 days. Calculated by measuring the number of unique users that have @ messaged you/follower count. This is a good way to see how engaged your audience is with your content over time. Another couple of metrics I really like here, along the same lines, are the Unique @ Senders, Unique Retweeters, and Follower Retweet %. Taken together, these four give a pretty good sense of whether you’ve got one small group of vocal supporters doing all the message-spreading, or you’re starting to genuinely build on that core, to attract new supporters who are keen to tweet your cause. In general, Engagement is likely to be the most relevant area for organizations using social media primarily to stay connected with their members; and, in fact, for anyone who is using Twitter as a tool for relationship building, more than a simple one-way broadcast channel. How much of your nonprofit’s Twitter activity is two-way conversation with your supporters? How engaged are other Twitter users with the content you’re tweeting? These are the kind of questions you’ll want to ask, as you look at these numbers and how they trend. 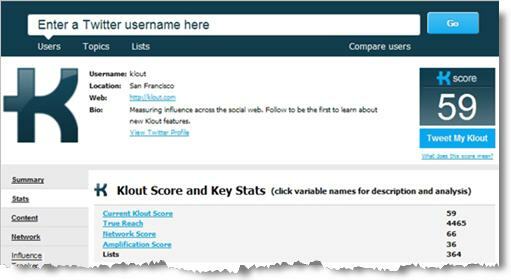 Regardless of your organization’s specific Twitter strategy and its goals for being on Twitter in the first place, however, Klout’s various metrics are bound to offer new insights into how you’re connecting with others on Twitter and how you might adjust your Twitter approach to better meet your nonprofit’s particular goals. If you use CoTweet to manage multiple Twitter accounts (or for multiple users on your nonprofit organization’s official Twitter account), Klout’s just been integrated. That means the CoTweet profile sidebar now shows the Klout Score for other Twitter users, if they have a Klout account, alongside their followers and following numbers. It’s another way to get a general idea, at a quick glance, of the relative “influence” of the individuals within your organization’s Twitter tribe and others to whom you might want to reach out. Have you tried Klout yet, or any of the other Twitter analytics tools we've been looking at in the Better Twitter Analytics series? 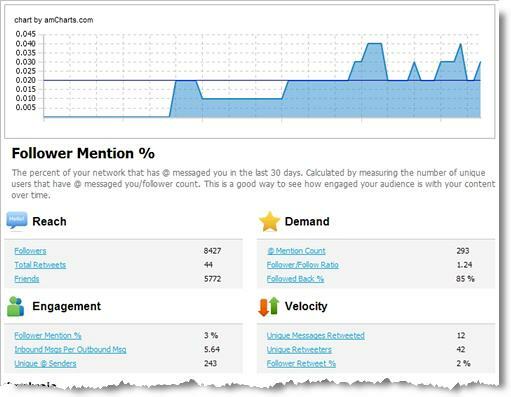 What features are most useful to your organization, and what features would you like to see in a Twitter analytics tool? Share your thoughts in the comments!